North Americans are so enamored with wood warblers that we often forget that folks in most countries don’t get to see these exquisite insectivores. 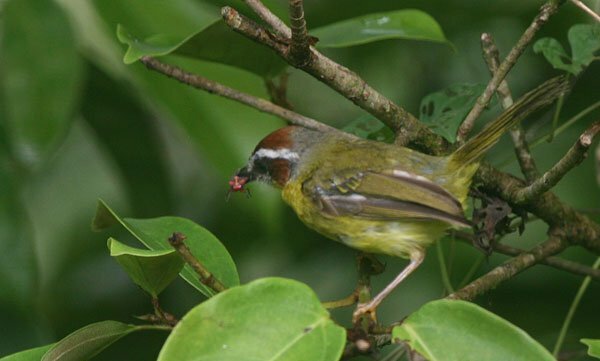 Even less forgivable is that we often forget that folks in many other countries in what is considered the New World actually DO get to see warblers, in some cases with great frequency! A veritable rainbow of warblers winds from the Caribbean through Central America deep into South America. Many of these warblers are in the genus Basileuterus. One Basileuterus warbler that sometimes makes it into the United States is the most righteous Rufous-capped Warbler (Basileuterus rufifrons). This spritely stunner occasionally turns up in Texas or Arizona, but absolutely thrives throughout most of Mesoamerica and even into parts of South America. Like other wood warblers, it enjoys a steady diet of spiders, insects, and other invertebrates, which it gleans from tropical trees and brush. 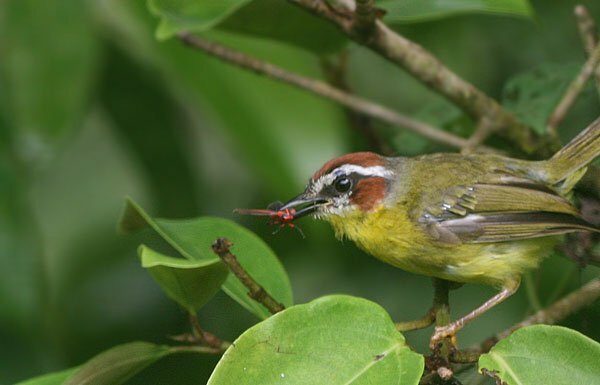 I’ve been privileged to see Rufous-capped Warblers a number of times in my travels, but my best sighting occurred in El Valle, Panama while staying at the sensational Canopy Lodge. My (amazing) guide Danilo and I stopped at the Oropendola Tree (if you’ve been to La Mesa, you know the one!) to scan for Giant Cowbirds when this critter caught my eye. Does this cap make me look fat? Clearly, Basileuterus rufifrons is named for the rufous color of its cap. 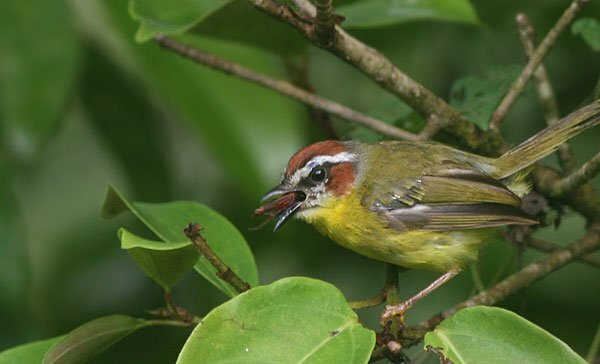 However, most taxonomies have lumped this species with the Chestnut-capped Warbler (Basileuterus delattrii), which presumably has or had a darker brown crown. 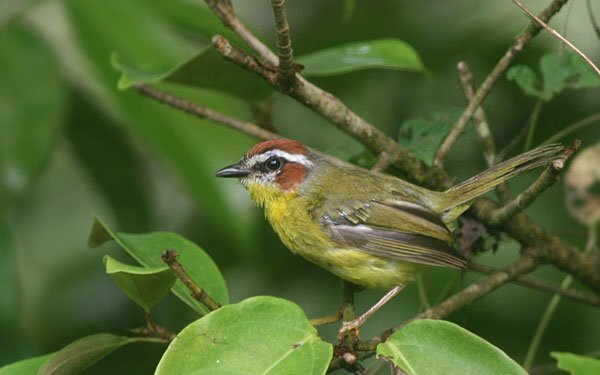 Since the chestnut-cap occupies the southern portion of the rufous-cap’s range, the bird above may be considered the former rather than the latter by some authorities. No matter how you call it, that cap looks rather rufous to me! I remember a story about a fledgeling birder who, after being taught how to pish for the first time, pished in one of these babies on a Texas CBC. I wonder what lunch was? Reminds me of the Yellow-breasted Warbler of South East Asia.